Photo of root tip infected with AM. 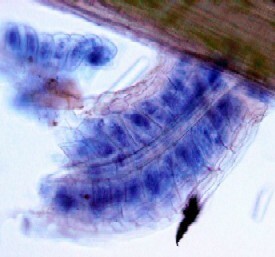 The blue stained areas are the fungus. Photo courtesy of Dr. Carla Zelmer, University of Manitoba. Arbuscular Mycorrhiza (AM) is a soil fungus that has a symbiotic relationship with plant roots. AM enhances plant nutrient uptake by increasing root surface area, provides protection against harmful fungi and nematodes, and improves soil structure. Most crop plants are at least partly dependant on mycorrhizae for uptake of immobile nutrients, especially phosphorous. Improved access to phosphorus is particularly important in low-input or organic farming as these nutrients are often limiting. One important plant group which does NOT associate with AM is the Brassica species, which includes plants such as canola and wild mustard. There are many factors that affect mycorrhizal colonization rates. Long-term phosphorous fertilization and tillage have been shown to decrease mycorrhizal colonization. Alternatively, winter cover crops have been shown to increase mycorrhizal colonization, by providing a continuous host plant for AM colonization. Lots of non-mycorrhizal crops (such as canola) in rotation may inhibit AM colonization. The aim of this study was to measure the long term combined effects of crop rotation and chemical inputs on the level of mycorrhizal colonization in flax, in the Glenlea Long-Term Crop Rotation Study. Samples were taken from the ongoing long-term crop rotation trial at Glenlea Manitoba in 2003.. Flax plants were sampled from organic and conventional (full input) plots in Wheat-Alfalfa-Alfalfa-Flax (W-A-A-F) and Wheat-Pea-Wheat-Flax (W-P-W-F) rotations (see below). The conventional plots received fertilizer based on soil tests and pesticides based on economic thresholds. The organic plots received no fertilizers or pesticides. The plots were in their twelfth year of this treatment, the fourth year of the third rotation. Soil cores were taken randomly from each plot forty days after seeding flax, when flax was 21 cm high on average. These soil cores were then washed to obtain the root systems of individual flax plants. The roots were cleared in 10% KOH and stained with Trypan Blue. Length of root colonized and total root length was determined. Arbuscles, the structure between the fungus and host plant cell, were used as identification for colonization. In this experiment, the level of flax root colonization with AM was significantly higher under organic management. This is most likely due to the fact that soil P levels were lower under organic management (see table below). Other research has shown that mycorrhizal colonization is higher when P levels are low. AM colonization was somewhat higher in the wheat-pea-wheat-flax rotation, although this difference was not statistically significant. Lower AM colonization in the wheat-alfalfa-alfalfa-flax rotation was most likely due to the greater amount of tillage used to terminate the alfalfa. Other research has shown that tillage negatively affects AM colonization. Management of inputs (full inputs vs. organic) had a smaller effect on AM colonization in the forage rotation than the annual rotation (see table below). Although the exact cause of this is not clear, we can speculate that weeds may have caused this difference. The forage rotation had high numbers of wild mustard, while the annual rotation had very few wild mustard plants. Wild mustard is not associated with AM, and may even inhibit AM colonization. Therefore, AM populations may be lower than expected in the forage rotation because of the abundance of this non-host weed. Alternatively, green foxtail is known to have an association with AM. The wheat-pea-wheat-flax rotation had very high numbers of green foxtail. More green foxtail in this rotation may have encouraged AM populations. More testing needs to be done in order to determine if this is, in fact, what is occurring. Table 1. Mycorrhizal colonization, soil P, and weed populations in two crop rotations under organic and conventional management. Organically managed crops have higher levels of AM. Tillage negatively affects AM levels. The effect of crop rotation, use of synthetic inputs and soil management on mycorriza populations need to be considered when making management decisions.